I know that I talk all the time on here about healthy meal and the crazy ideas and grill-outs and neighbor nights we regularly enjoy together. But I have another set of “neighbors” who I also see almost every day, who have become an equally important and awesome part of my life — they are the kitchen crew at the city’s best farm-to-table restaurant, which happens to be conveniently located just one floor beneath me! Oh my goodness, I love having them as neighbors. After two years of daily impromptu chats — from the early squinty hours when I take my dog out and we’re all standing around guzzling coffee together, to our mid-day “hellos” as I return from the grocery store and we all swap details about what we’re cooking that day, to the evening “inquisition” when I ask all about what cool dinner party they’re hosting that evening and they comment upon my yoga-pants-to-high-heels-transition and ask all about the new date I’m going to meet — let’s just say that have gotten to know one another very well. And we all basically feel like family. And I absolutely love it. Suffice it to say, I lucked out all around when it comes to amazing neighbors of all kinds. Well, the other perk to having these guys in the building is that the chef from the restaurant generously grants me use of their epic herb garden that’s conveniently located right outside my back door. And I do mean epic. They have every kind of basil! Parsley galore! So much oregano! And don’t even get me started on the epic bushes that are their sage plants. It is freaking bountiful, and I am more than happy and grateful to help them out with the abundance. Especially with that parsley and cilantro. When they’re in season, there’s always one sauce each summer that must be made. 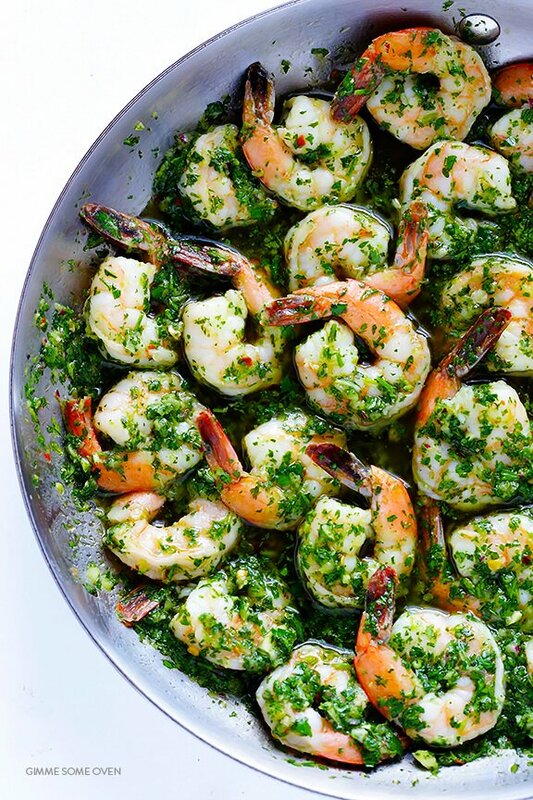 This Argentinian sauce has long been one of my favorites. 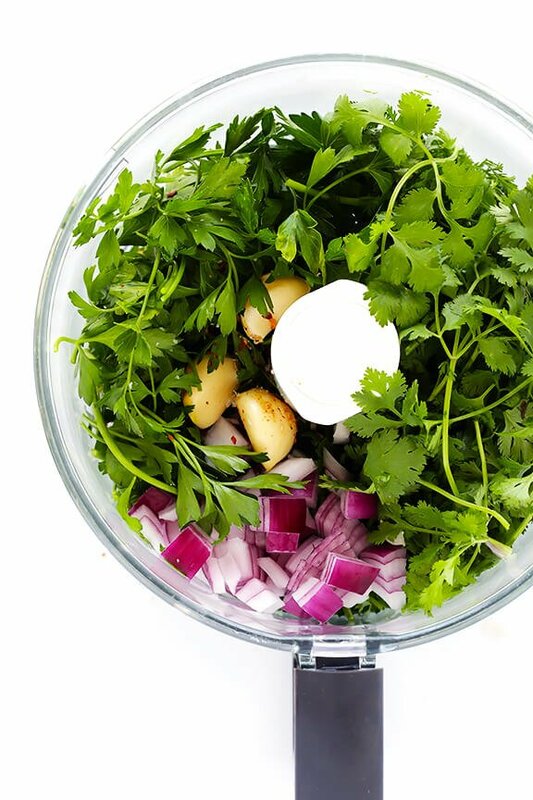 It’s chocked full of fresh herbs and flavors, it’s super quick and easy to make, and it tastes great with just about any proteins or vegetables. 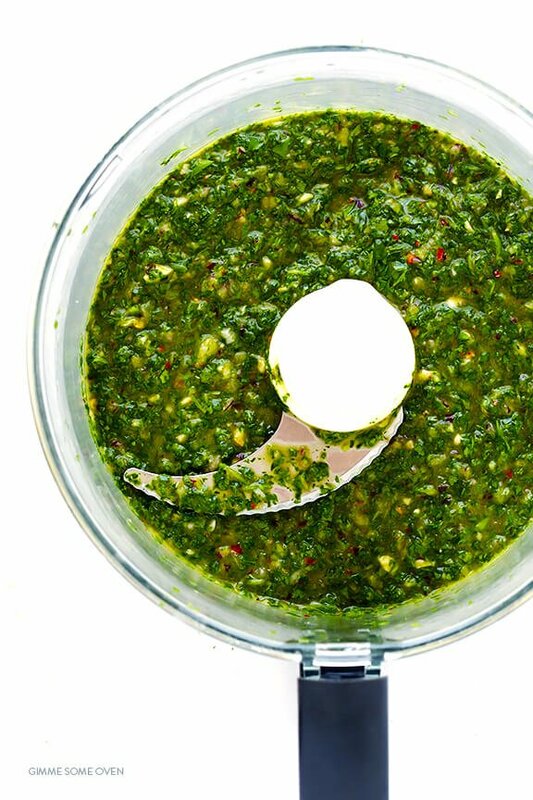 I often use it as a dipping sauce for parties, or as a simple basting sauce for whatever I toss on the grill. 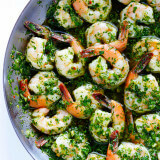 But one of my all-time favorite uses for chimichurri is to toss it with some sauteed shrimp. 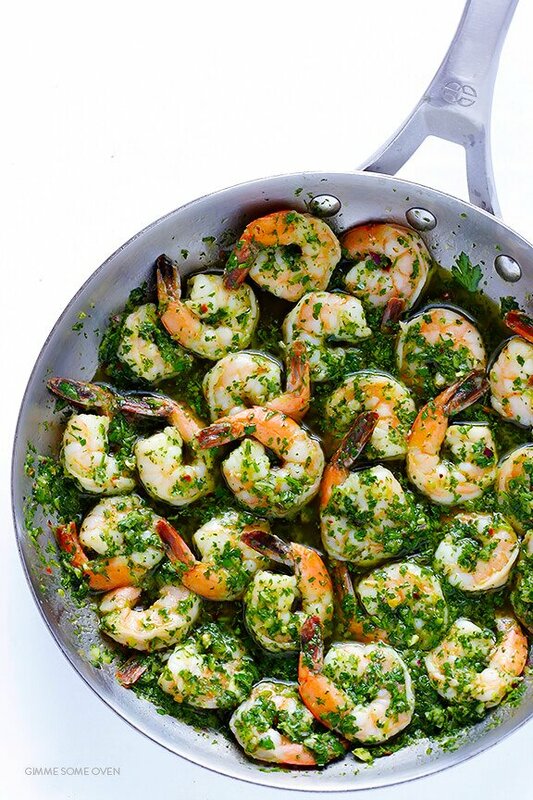 Chimichurri and seafood naturally pair perfectly together. 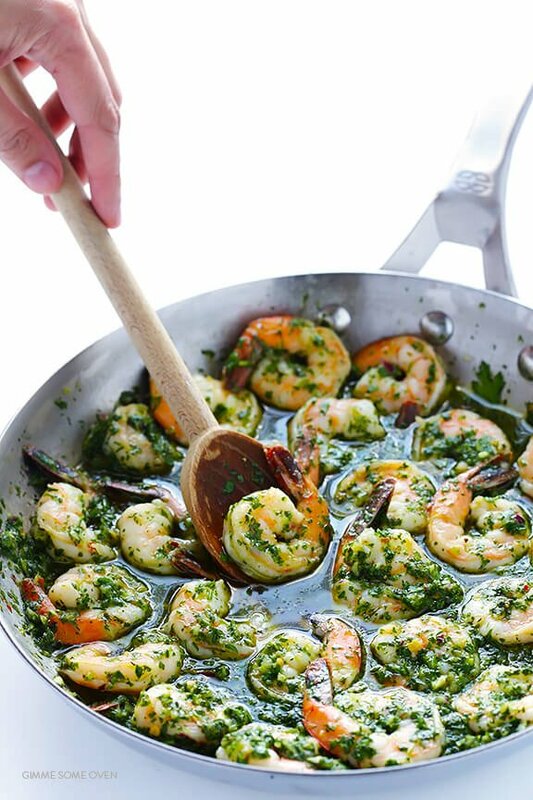 And if you multitask whipping up the sauce while the shrimp is cooking, this dish can literally be on the table in less than 10 minutes. Big thanks to my restaurant neighbors for all of the fresh herbs (yet again), and hope that you enjoy this recipe as much as I do! If you like it, visit Gimme Some Oven for the recipe.